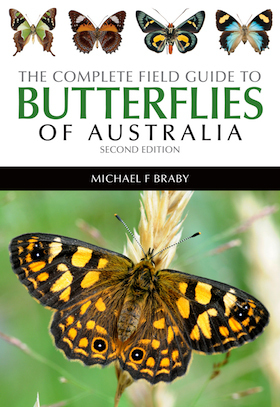 Braby - Butterflies of Australia or his Complete Field Guide? Butterflies of Australia (publisher’s page) appeared in 2000 as two substantial large-format hard-cover volumes describing ‘nearly 400’ species and was universally lauded for its completeness and presentation. It is still acknowledged as the standard reference; real copies are becoming harder to obtain but it is readily available as an e-book. The first edition of the the Complete Field Guide (CSIRO 2004) documented 416 species in 352 pp, so the current edition represents a worthwhile step forward. The sequence of the three books reminds us that we’re still discovering new species – about 10% in 16 years. The bottom line is that if you only want one Australian butterfly book, the new edition of the Complete Field Guide is the one you want. There are other options, of course, but this one is authoritative and comprehensive while still being portable and affordable. * Naturalists’ Bookshelf 1: Plants is here. Hello Malcom, thankyou so much for a delightful page, which by chance I have only just found. I arrived in Cairns two years ago and have been building a small garden to attract butterflies, of which Cairns has the most beautiful and plentiful imaginable, attracting over 20 species so far. I am very new at all this so it is a real learning curve, and what a delightful one. My neighbour and I both planted Aristolochia vines and are enjoying the watching and pupation of these creatures. She gave me my first caterpillar a fortnight ago and since then the females have been circling the area. So, here’s hoping they found the vine suitable. She has just sent me beautiful pics of one of her Birdwings pupating, and thanks to your page on emergence we now know why a huge caterpillar was on her Mother-in-law’s tongue. Unknowingly she thought it was lost and put it back on the vine, however I am sure it would have sorted itself out. We are now the wiser since I forwarded her your page. I reborrow Michael Brady’s Complete Guide from the library, which has been invaluable, so good to know he has a newer edition that would be as well for me to purchase. On a recent trip overseas I searched Cairns and surrounds to by a silk scarf featuring our magnificent butterflies…. nothing to be found. So, being of an artistic bent I decided to have a crack at it myself. Beginning days yet but the recipients have been totally awestruck…can’t do better than giving people happiness, can you. Hope to encounter more folks interested in butterflies here soon. Early days.